In Super Beat Sports, you are the lone human on the planet Muzicalia. The residents of this planet love to play sports. The sports look similar to our own, but with at least one major difference: they are all played to a musical beat. The musical beat means most of these “sports” are actually simple rhythm-matching games with different skins, but they are cute and appealing. Of the five “sports”, the first three are score-based: play singly or cooperatively to beat the score threshold and advance to a new level. 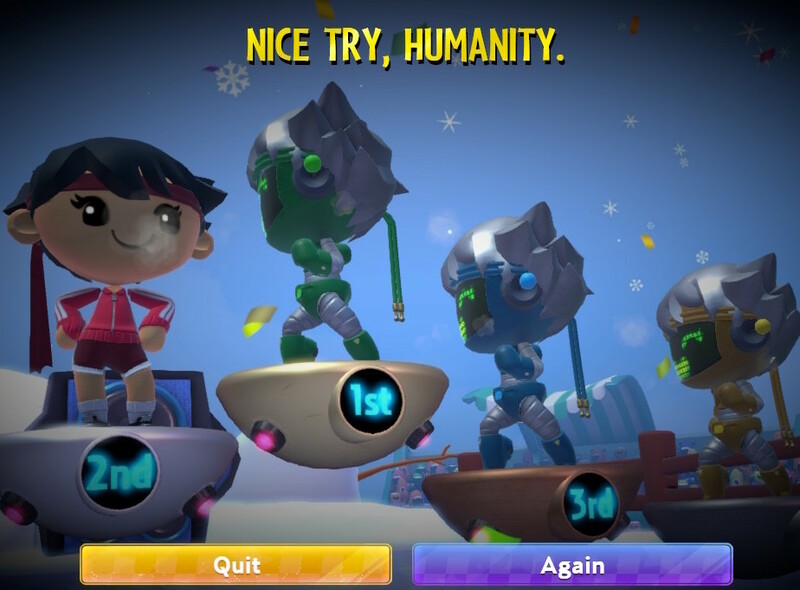 The last two (Rhythm Racket and Buddy Ball) are pure competition: play with a mix of human and/or computer players and be the last one to survive elimination. Whacky Bat – Whacky Bat is a sort of baseball home-run derby. 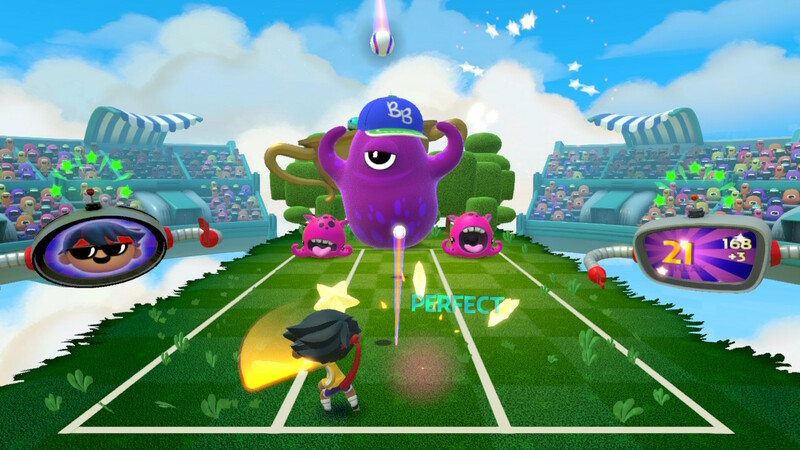 Hit the balls thrown by various aliens; hit every ball without missing to build up your streak. 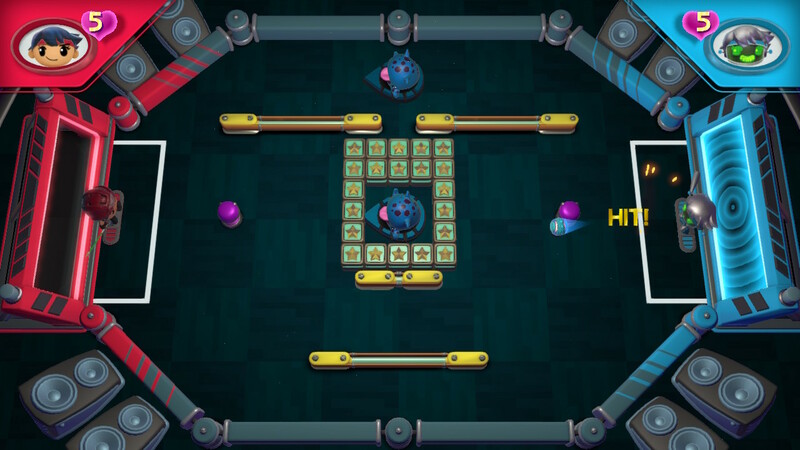 End each level with pitches from “Throw-bot”. 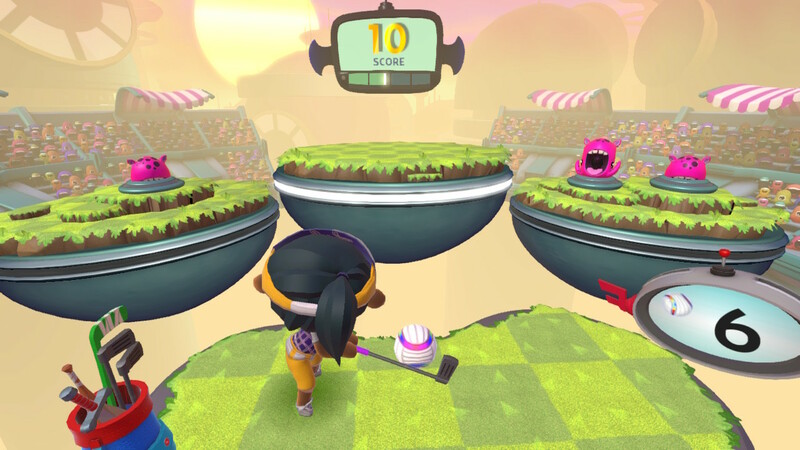 In two player mode, each player may only hit balls that are white or their own color (red or blue). Net Ball – This is volleyball. The ball is bounced back and forth among all the players according to the musical pattern. Be ready to return it when it is volleyed to you! Several times each level, you are given the opportunity to spike the ball. 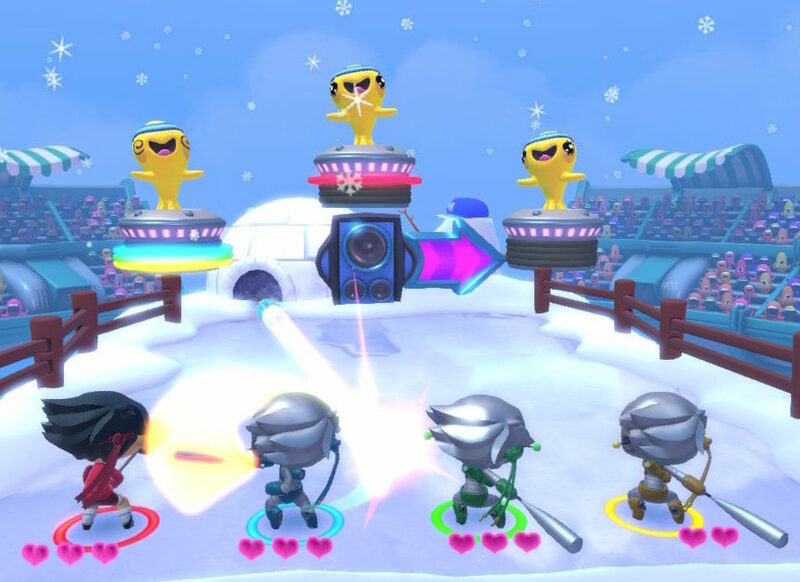 In two player mode, take turns returning the ball (your turn is indicated by the color of the halo on the alien serving the ball). 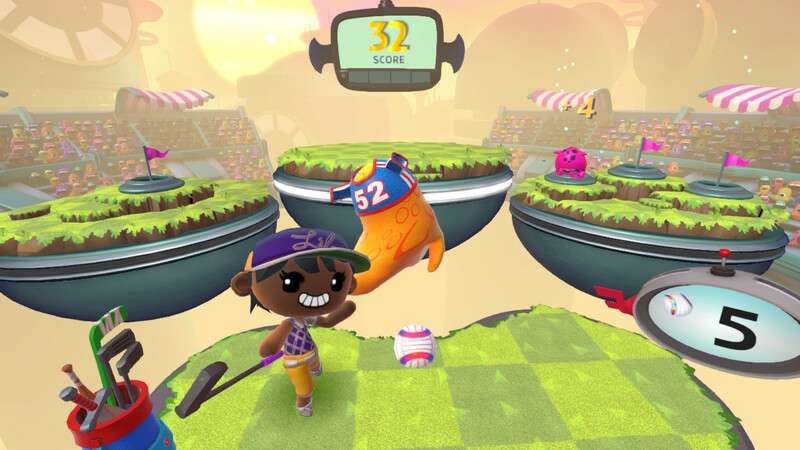 Gobble Golf – The weakest game, Gobble Golf is more like Simon than golf. Watch the pattern, then hit the balls to the gobbling aliens in the same pattern. 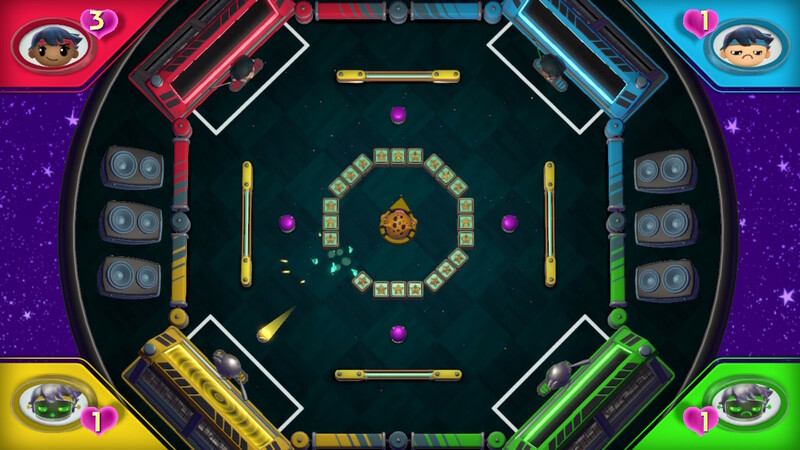 Two-player mode uses color-coded aliens, so the players must work together to complete the pattern correctly. 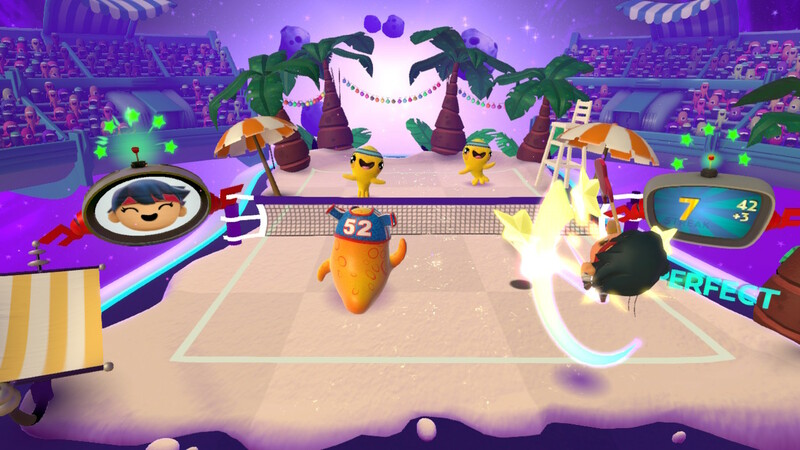 Buddy Ball – I don’t know if this is supposed to be more like tennis or the playground game four-square. Hit the ball to aliens, activating power-ups and avoiding disasters. Try to outlast your opponents (human or AI) without missing the ball or hitting the bombs. Rhythm Racket – Rhythm Racket is most like air hockey with crazy power ups and obstacles. Play with up to 4 players, each protecting a goal of their own color. Hit the ball when it approaches your goal, using walls, power-ups, and rotating aliens to get it into an opponent’s goal. After each goal scored, the field layout changes. 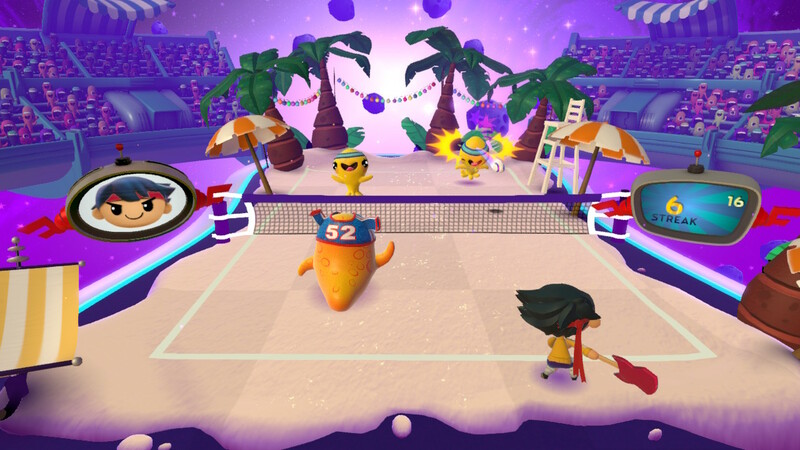 Super Beat Sports is a light, fun set of games. The early levels of Whacky Bat, Net Ball, and Gobble Golf are easy enough for our six-year-old to master and our three-year-old to attempt. Since there is no elimination in these “sports”, they can feel too easy for experienced rhythm-game players. Switching to “Pro Mode” (available after completing the first level) can help with that. Although there is still no elimination in “Pro Mode”, the speed and difficulty increase dramatically. 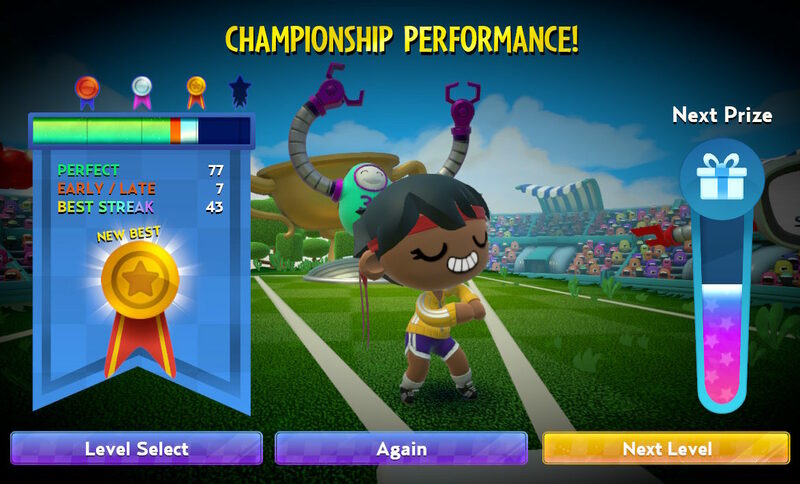 The levels reward high score attempts with “prizes” of new equipment and outfits. Kids and adults who enjoy collecting will be spurred on to keep playing. There are a lot of nice touches that elevate this light game apart from the crowd. The animations are cute and very well done; the avatars are charming and can “celebrate” in multiple ways after completing a level. 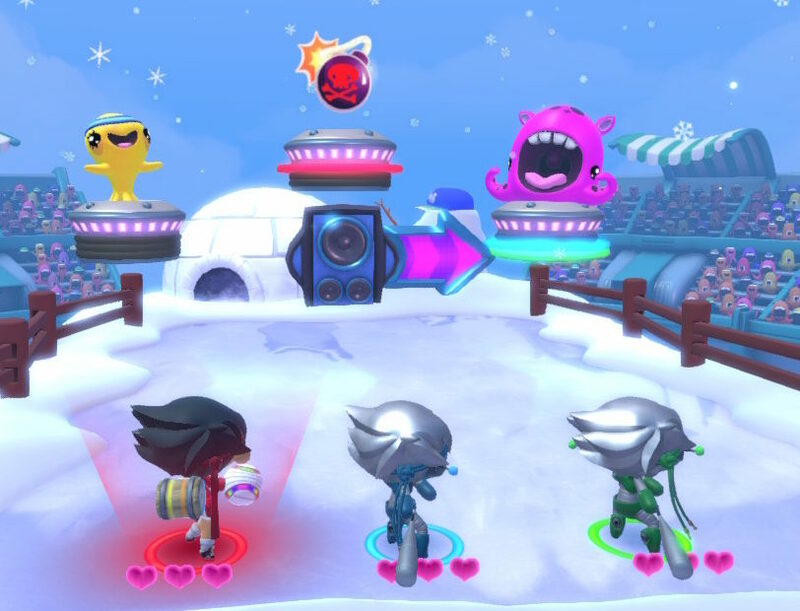 Harmonix weaves humor throughout the game, almost anywhere that text appears (level selection, end-game rewards, and loading screens). 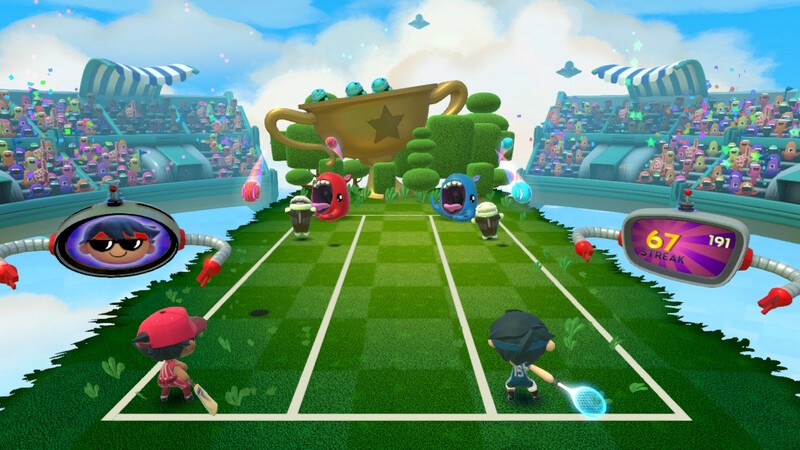 Overall, Super Beat Sports is an easy and light family game, but doesn’t hold much ongoing interest unless you’re a completionist. We found it makes a great short filler – perfect when you want to spend a few minutes playing a video game that doesn’t make you think too hard. This could be the end of a long day at work, or on the train on your way into the city. The folks at Harmonix know their skill set and put it on display here, offering excellently tuned rhythm-patterned gameplay. Super Beat Sports retails for $15 and you can buy it directly from Nintendo via the Nintendo eShop. The Family Gamers were provided with a review code for Super Beat Sports.